We couldn't do any of it without YOU! 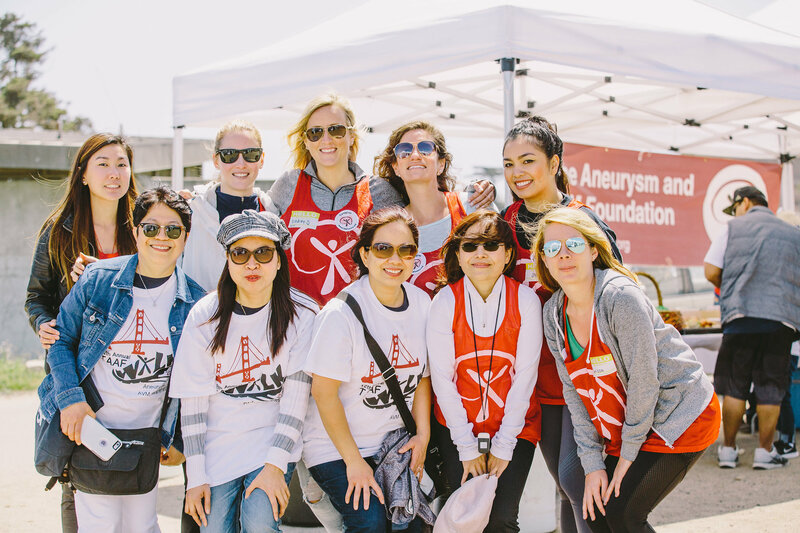 TAAF Walk is an honored San Francisco tradition celebrating a National Day of Aneurysm and AVM Awareness sponsored by The Aneurysm and AVM Foundation (TAAF), and this is our 14th Annual Aneurysm and AVM Awareness Walk. As a community-oriented non-profit organization, we rely on the support of volunteers, businesses, and the medical community to ensure the success of our event and programs. By supporting TAAFWalk, our sponsors make a significant impact on the lives of those affected by aneurysm and AVM, and we are truly grateful for their part in our journey. 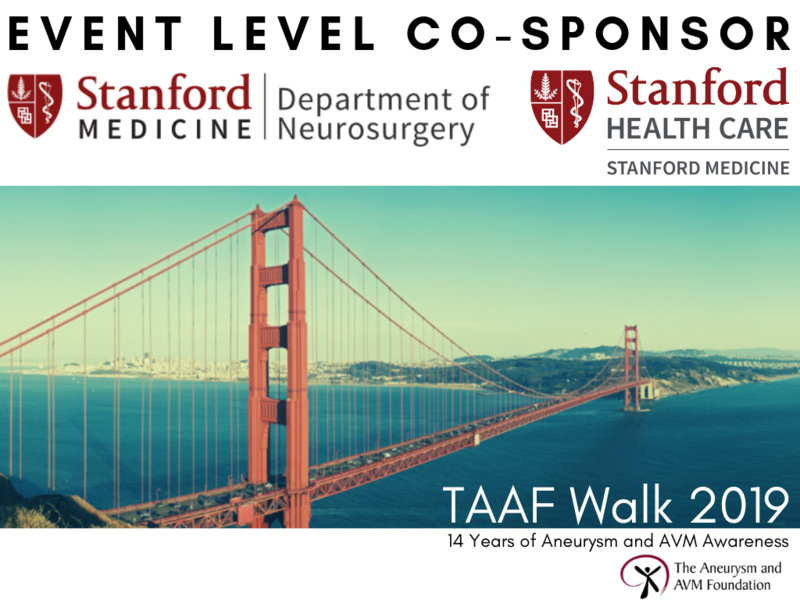 Our sincere thanks and gratitude to both Stanford Medicine's Department of Neurosurgery and Stanford Health Care, one of our TAAF Walk 2019 Event Level Co-Sponsors. Stanford Health Care is no ordinary health system. As part of Stanford Medicine and the larger Stanford University family, they provide care as an “academic medical center.” In terms of service to the greater aneurysm and AVM community, together they are an international referral center for complex neurovascular disorders of the brain and spinal cord. Be sure to meet representatives from their team, such as neurosurgeon Dr. Gary Steinberg, and click their links above for more on the great works they do! Thanks again to EVENT Level Co-Sponsor Stanford Health Care and Stanford Medicine's Department of Neurosurgery! When we think of UCSF, we think of the home of our support group and the majority of our Board of Directors. But like their co-hosts, UCSF's renown is no secret. 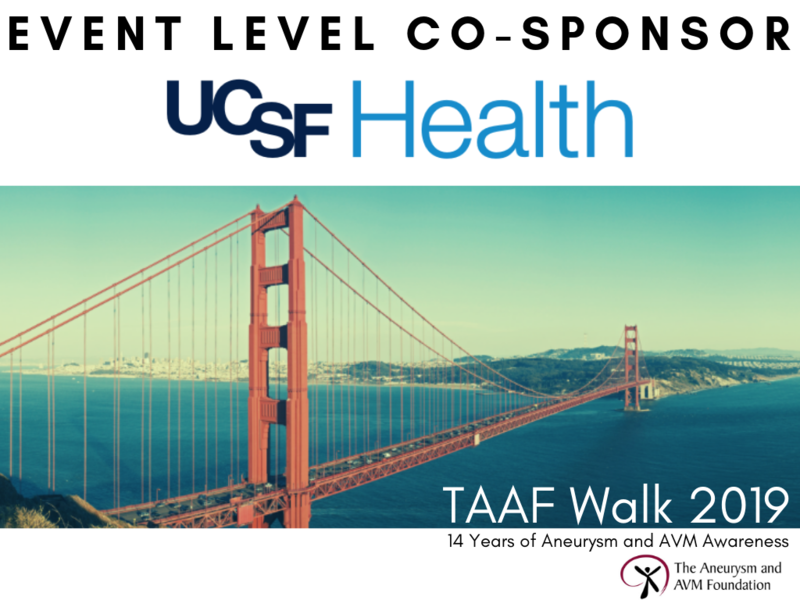 We are incredibly grateful for the continued support of UCSF Health, our TAAF Walk 2019 Event Level Co-Sponsor. UCSF Medical Center’s neurology and neurosurgery programs are ranked by U.S. News & World Report as #1 in California and #3 in the nation. Be sure to meet representatives from their team throughout the day as many of them volunteer and attend the event, and click their links above for more on the great works they do! For more on UCSF team members who serve on our Board of Directors, click here. 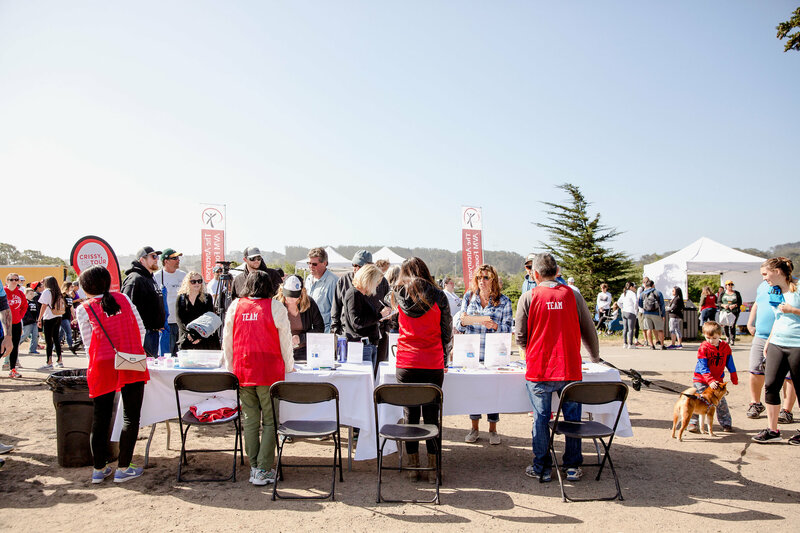 Thanks again to EVENT Level Co-Sponsor UCSF Health! Known for their amazing Mobile Stroke Treatment Program, Cleveland Clinic has one of the highest stroke-related patient volumes in North America, and we are incredibly thankful for their support as Platinum Sponsors for TAAF Walk 2019. Attending the Walk? 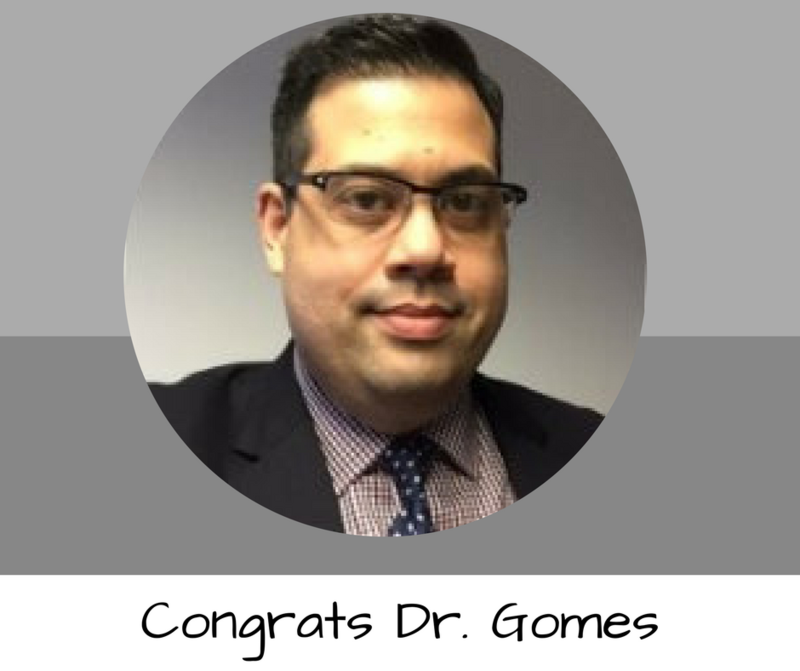 Then you MUST meet their head of Neuro ICU--one of your two 2017 Cerebrovascular Research Grant Award winners--Dr. Joao Gomes, as he presents his aneurysm project findings. 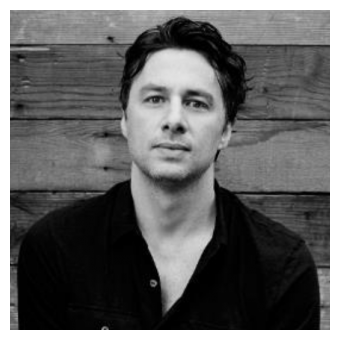 Read more here before you meet. Thanks again to Platinum Sponsor, Cleveland Clinic! TAAF Walk would be impossible without the support of Silver Sponsor, KCK Builders. From ensuring we have power through the use of their generator to donating the portable bathrooms and volunteer hours galore, they are indispensable and we are grateful to our friends at KCK Builders. Our sincere thanks to Bronze Sponsor the Integra Foundation who is back again too as our Water Sponsor. Your contribution is integral to the success of each walker come Walk day. The Bay serves up every kind of weather, so we are grateful to also serve up refreshing water thanks to your generosity! Please visit House of Bagels (SF) and your friendly, Marina Safeway store. Without these outstanding donors we would all be really hungry. Do you love learning and fun games? Us too! 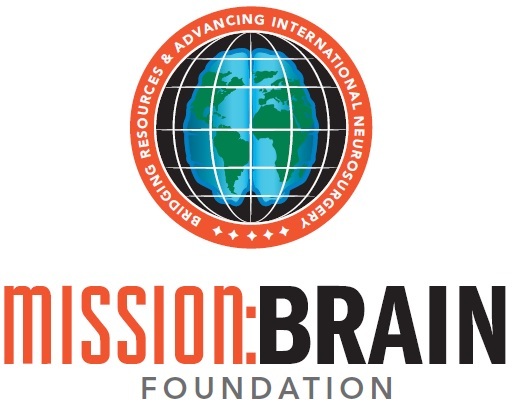 Give a big cheesy-grinned thank you to our friends of Mission:BRAIN, returning hosts of our Pediatric Tent. 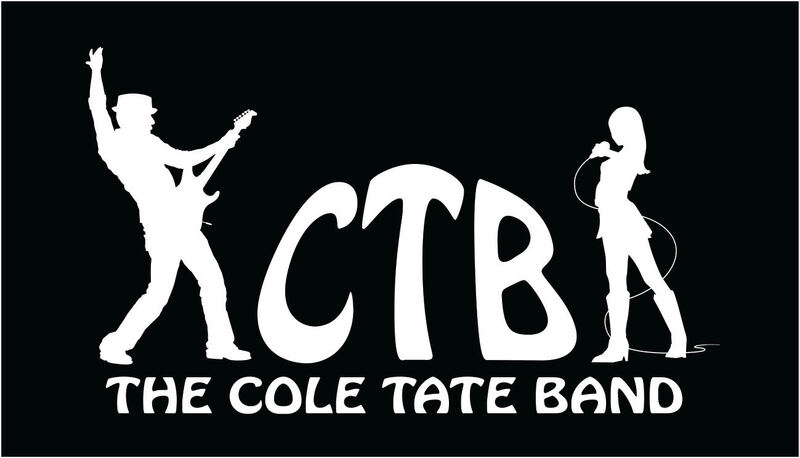 The Cole Tate Band is the official TAAF Walk 2019 Rock Band... and we couldn't be more stoked! You can't have a TAAF Walk without your party people; ours are the amazing folks from Glass Coat Photo Booth. Get a buzz before headed out to TAAF Walk; later say hi to Gabriel, friend and Manager of the store on Fell & Broderick! Our gratitude to the crew at Trader Joe's for supporting our additional hydration needs. SPECIAL THANKS TO: Crystal Boyd for her amazing logo work and support, face painting from The Party Artists, Grant Recipients, The Walk Committee, and our amazing TAAF Walk Volunteers!